Before cranberries, imported from the Northeast, were available in North Carolina, pickled peaches were a staple on the Thanksgiving dinner table. In many places around the state, they still are. Wash and peel peaches. Put cloves and cinnamon loosely in a clean, thin white cloth and tie the top tightly. Cook together the spices, sugar, vinegar and water for ten minutes. Add the peaches. Cook slowly until tender, but not broken. Let sit overnight. In the morning, remove the spices. Drain the syrup from the peaches and boil the syrup until thickened. Pack the peaches in hot sterilized jars. 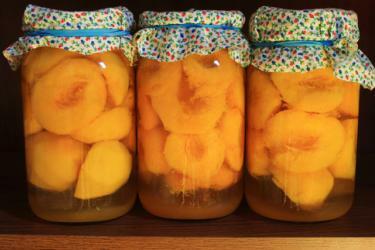 Pour hot syrup over the peaches, filling the jars to the top. Process 20 minutes in a boiling water bath. This recipe was submitted by Paige Burns of Southern Pines who said it originally came from the chef at Crooks Corner in Chapel Hill.